If you have been reading our weekly newsletter, you know that I have been teasing recently about a new competition Japan Centre are going to be running to win some tickets for the coolest, cutest, and craziest Japanese exhibition of the year. That time has now come! Hyper Japan is being held at the Olympia in West London from the 22nd to 24th of July and will be the biggest J-culture event of the year. There will be loads of cool things to watch, listen to and snack on, as well as music performances by Kanon Wakeshima! This competition is open until Tuesday 28th June, so there is plenty of time for you to leave a comment. We will choose a winner on 28th June, so make sure you check your facebook in the evening to see if you have won! 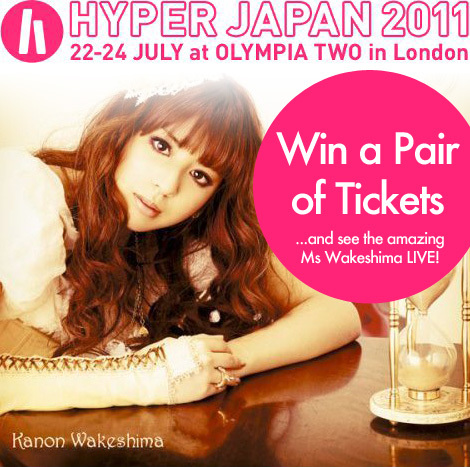 If you enter the competition, please make sure that you will be available on the 23rd July to attend the Hyper Japan event in London. If you are chosen as the winner of the tickets, please confirm that you are able to attend the event within 48 hours of receiving the private message. This is to make sure we have enough time to arrange the tickets in your name. Any questions about the competition, please ask in the comments on the facebook blog and keep an eye out for more Japan Centre competitions. Posted in Uncategorized and tagged competition, events, hyper japan. Bookmark the permalink.